Don't be fooled. Challenge caches are not the same as Groundspeak challenges introduced in August 2011 and retired in 2012. Challenges are considered by many to be a replacement for virtuals as all premium members may issue a challenge where perhaps it is not wise to place a physical container. A challenge cache requires that geocachers meet a geocaching-related qualification or series of tasks before the challenge cache can be logged. Additional Logging Requirements were banned from geocaching as there were many silly requirements. Challenge caches are a controlled compromise providing an even more addictive element than caching for smilies. You must find a cache that has not been found for at least a year. 29 Feb 2012 - I claimed this challenge with GCV08D - Stop; Look; Listen! (Bucks) which I found with Heff and my brother in-law. To satisfy this challenge you must have found at least one cache that was hidden in each year from 2001 to 2012 inclusive. 2007 GC10K49 - "You cannot be serious!" 2008 GC1860V - WTF: Magnets? None of those here! 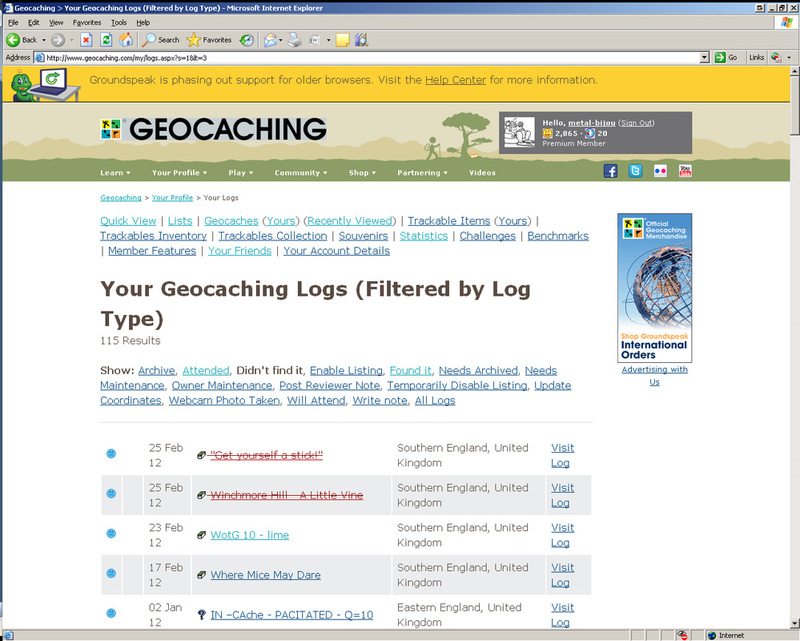 You must have logged at least 100 Did Not Finds (DNF’s) on geocaching.com. You must have logged three DNFs on the same cache and then demonstrated perseverance by finding the cache. DNF 1 – search with no info as to where it was. DNF 2 – popped away for a couple of nearby caches and then were driving past so a quick look. Found – Night time visit to find a couple searching. Only for me to put my headlights on the problem and a very QEF by me. Wish it had been the first time. The Well Travelled Cacher GB - find a cache in each 5-mile interval within a distance of 250 miles. A Large Leap of Caching Numbers - find one cache on a given day; two caches on another day; three caches on still yet another day and so forth all the way up to finding twenty nine caches on a single day. Do You Know Other Cachers - find three different kinds of caches hidden by 10 different cachers. Create a free website with Weebly!